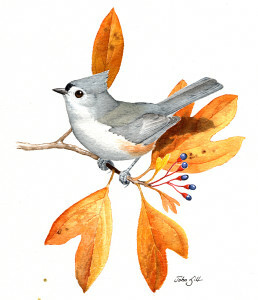 Tufted Titmice have taken Massachusetts by storm in the past thirty years. Copyright John Sill. Bird Conservation staff were in attendance at our climate change symposium last week, to enjoy a two part presentation about the impacts of climate change on the nature of the Northeast United States. Mass Audubon’s Regional Scientist Robert Buchsbaum, described the current and projected impacts of climate change on the nature of New England. Robert discussed changes that have already occurred due to warming temperatures, using examples from salt marshes, fisheries, forests, and vernal pools. The impacts of warming are particularly evident for birds. Robert presented data from our Breeding Bird Atlases and State of the Birds work, which show that the range distribution of many species has changed. Several species, such as the Tufted Titmouse and Carolina Wren, are experiencing range expansions and are now more abundant throughout Massachusetts. Other familiar species such as Tree Swallows and Black-capped Chickadees are predicted to decrease. Appalachian Mountain Club’s (AMC) Assistant Research Director, David Publicover, focused on the impacts of climate change in the mountains of the Northeast. The AMC has been collecting weather measurements on Mount Washington’s summit since the 1930’s and this is now used to study climatic trends and their impact on northeastern mountain ecosystems. This event was part of a series: Climate Change, Energy, and the Outdoors—an educational series co-sponsored by the Appalachian Mountain Club, Mass Audubon, and the Union of Concerned Scientists. This entry was posted in Climate Change, Events on December 14, 2015 by Lindall.